In memory of Sahtzat Loukman, 27 years old, murdered on 17 January 2013 in Athens, and Clément Méric, 18 years old, murdered on 5 June 2013 in Paris.This contribution seeks to mobilize certain concepts in order to symbolize what, in part, always resists symbolization. What is at issue is the return of fascism in Greece, the fact that the neo-Nazi Golden Dawn (GD) party have held seats in parliament for over a year now, with a portion of the population1 thereby assenting to their criminal acts and their exaltation of hatred and contempt. How can we deal with this unforeseen [inédit] phenomenon, unfolding in a society whose road towards the democratization of their state apparatus has from the beginning been pitted [creusé] by the bodies of the exiled, the tortured and the dead? If indeed this road does not constitute a ‘Greek exception’ but is rather the rule for a series of countries which have had similar politico-historical experiences, what remains to be understood is how it can be that this restaging of brutalized bodies, these public assaults,  and this open and unabashed expression of racist and fascist symbolic violence has led not to the condemnation of the GD but, on the contrary, to their institutionalization. Given the impossibility of dissociating the rise of fascism from the current crisis, and in particular from the policies imposed in order to ‘treat’ it, questions proliferate. Is what is at stake here a resurgence of older experiences that have accumulated over the recent history of this country? Is it a case of one ‘symptom’ being produced by another? Or is there an imbrication of pre-existing elements with new ones generated by the political, social and economic present? The first image that appears is brutally stark: a society that has plunged back into the most archaic of nightmares. For many, their very survival is threatened, and subsistence has once again become a question of life and death. By January 2013, the rate of unemployment had grown frenetically, to reach 27.2 per cent of the population,  compared with 14.8 per cent in January 2011 (with unemployment rates of 31.4 per cent for women and nearly 60 per cent for those under 25), while a very significant portion of the population has no medical cover and is, consequently, excluded from the healthcare system. Pauperization now knocks on the doors of social strata whose members formerly believed themselves to be safely protected from exposure to destitution and powerlessness [impuissance]. while dramatizing the threat and the phantasm of powerlessness, fascism reserves the role of ‘master’ for itself. From this perspective, there are a number of general concepts that might help us to symbolize the situation, and perhaps also to extrapolate from it – for Greece, even as it serves as an exemplary ‘laboratory’, is not the only country concerned by the crisis and the rise of fascism. In this sense, we are going to inscribe the current crisis, and its so-called treatment or therapy, in the context of a total crisis, one that includes a crisis of culture and values. Henri Lefebvre used the term ‘total crisis’ to describe the ‘normal state’ of Western societies as they appeared at the end of the prosperous postwar boom, in the late 1970s. Walter Benjamin’s consideration of fascism in terms of the aestheticization of politics allows us to situate the function of fascism on the level of social consciousness and to trace the dynamics of this function to the heart of the cultural universe of late capitalism in which we are immersed. Lefebvre, in his Troisième Critique de la vie quotidienne (1981), reminds us of what is ‘known but rarely said’: the capacity for destruction produces zones of prosperity. Wars and crises perform the function of the negative, purging the mode of production of its momentary excesses and priming a renewed technological base for the return of accumulation. Now, the invocation of a total crisis, itself more a hypothesis than an elaborated concept, is part of an interrogation that goes beyond the crisis’s own ‘punctual’ character; it extends to cover what Lefebvre characterizes as the critical state reigning in modern societies in general. In this sense, crisis is not meant to describe an uncertain period that occurs between two stable periods, but one that rather constitutes the rule and mode of existence of modern societies on a global scale. This situation can have unforeseen effects that go beyond the predictable ‘perverse effects’, including the destabilization of social values and the foundation of a ‘state of neo-barbarism’. Lefebvre makes a more categorical pronouncement on the crisis of modernity. This crisis consists, ultimately, in a separation between modernity and modernization. Modernity ended up designating an ideology, an unfulfilled promise of happiness; modernization came to mean a technological practice unburdened of any ideological mission to pursue the radical transformation of society. It is thus a question of the possibilities that emerge when technological utopia is separated from political utopia, to the detriment of the latter. Today, the ‘policies’ or politics [politiques] imposed on a series of countries (Greece, Spain, Portugal, part of Italy, and, most recently, Cyprus), in the guise of treatment for the debt crisis, bear the mark of this separation between ‘technology’ and ‘politics’, with the former reducing the latter to its shadow. Economic ‘technology’ is tested on these populations, and is now freed of any political attachment, and also freed of any principle of justice or the equitable distribution of resources and rights. From this perspective, Benjamin’s well-known analysis of fascism as the aestheticization of politics, as an attempt ‘to organize the newly created proletarian masses without affecting the property structure which the masses strive to eliminate’,  has again become strikingly relevant. Fascism aims to let the masses express themselves while conserving this regime. The logical terminus of this process, according to Benjamin, is an aestheticization of political life that culminates in a single point: war. Its vision of imperialist war as ‘a rebellion of technology which collects, in the form of “human material,” the claims to which society has denied its natural material’,  emphasizes the detachment of technological utopia from political utopia. But this vision also furnishes fertile suggestions regarding the ‘sacrifices’ that the workforce is obliged to make in Greece, and in all the other countries undergoing ‘budgetary reforms’. In Greece, this general problematic is tied to the current socio-economic context, but also to a recent politico-historical experience of major importance for understanding fascism’s return. This experience indicates the stable albeit latent presence of a para-state ‘apparatus’ that takes its bearings and its filiations from the collaboration with the Nazi occupation, from the terror of the ‘communist witch-hunt’ during the civil war and the repressive state that followed (with its parastatal and paramilitary groups), through to the dictatorship and torture apparatus of the colonels. The transition from the Greek state towards democracy, the Metapolitefsi, has pushed the residues of this apparatus away from the centre of the public stage, without, however, making them disappear altogether. The privileged relations that the neo-Nazi party enjoys with the police can and should be examined in this context. Moreover, the collusion between this party and the police’s special forces of repression actively participates in reinforcing the image of invincibility that its leaders are trying to build. 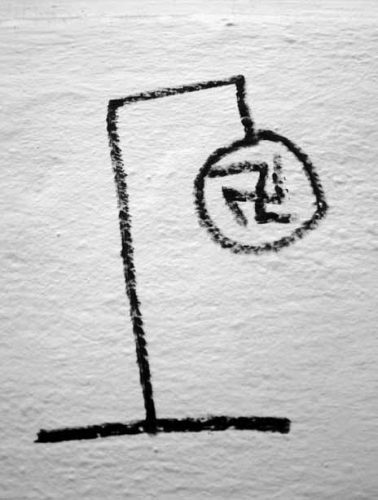 Disavowing their (neo-)Nazism, they foreground their image as a merely nationalist party, all the while letting their affiliation with National Socialism be plainly seen (through their gestures, references, symbols, denial of the Holocaust and terminology – which includes such terms as ‘sub-human’). Without abandoning any elements of the old ‘anticommunist’ line, their field of intervention prioritizes the hunting and elimination of the immigrant population, especially so-called people of colour and Roma, and of homosexuals. from the effective immolation of the Labour Code in the fires of unemployment and the suppression of even the slightest sign [indice] of the public good and social protection, to growing levels of despair and death rates. For more than three years, Greek society has lived under the threat of annihilation. Individuals now live with this fear and are constantly brought face to face with their actual powerlessness. Parallel to these real anxieties – with even basic subsistence no longer assured – phantasms of annihilation are repeatedly evoked in and by the dominant political discourse. The latter develops on the basis of a generalized sense of threat or menace. By reiterating in their political discourse the threat that comes from ‘outside’ (from the EU, the IMF and the ECB), successive governments have appropriated and concretized it in a parliamentary state of exception. The phantasms are taking up more and more space in the public sphere, lending support to the dominant political discourse’s calls for renunciation. And the fascists enter into this phantasm in a decisive fashion. Indeed, the fascists dramatize this generalized condition of menace or living under threat, of living in and with the condition of powerlessness. But they dramatize it while appropriating for themselves the role of master, the role of being the ones who have initiative and control, who are in a position to humiliate the other and deprive her of her dignity, even her life, and to make her afraid. And so they anticipate their place in the consciousness of the strata of the ‘petty bourgeoisie’ who have recently been proletarianized, or who are en route to proletarianization, and who are consequently overwhelmed by the possibility of their own dispossession and destitution. The fascist threat, moreover, is scripted and staged at the same time that groups of muscled and armed men are attacking isolated individuals, at home and in public. It has become its own propaganda and propagation. This public ‘dramatization’ reanimates the phantasm of powerlessness, setting it up centre stage, but in a ‘suitable’ and compensatory fashion. It transforms actual powerlessness into phantasmatic power. The roles are reversed, and those who felt themselves beleaguered by destitution and pauperization become aggressors in turn, by means of a pure transposition. To hunt down ‘the foreigner’, the homosexual, the militant and the intellectual allows them to hunt down the image of themselves in a state of destitution and powerlessness, an image that they seek to refute and escape. The social strata seduced by fascism draw a double benefit from this reversal: they can finally witness the realization of the phantasm of powerlessness that threatens them, without becoming its object. Saved on the phantasmatic level thanks to their identification with ‘the master’, they are able to dedicate themselves entirely to renouncing the effort to effect the slightest political change. They can denounce the whole political system as ‘corrupt’, without making the least distinction or differentiation in terms of class membership or position. On this point, the neo-Nazis insert themselves into the political system as an anti-systemic force, despite the fact that, elsewhere, they support all the measures of social decay. With respect to this point we cannot avoid evoking, however briefly, the establishment of a parliamentary state of exception, charged with the task of implementing the policies that are ravaging society, and that incorporates a substantial part of the neo-Nazi party’s discourse. Nor can we overlook the great national and European media campaigns that reiterate the discourse of menace and threat, while presenting any alternative as catastrophic and thus reinforcing this very state of exception. Nor should we ignore, of course, the impunity that has benefited the neo-Nazis. A loss of dignity, of social benefits, of public goods. A loss of bearings and values. A loss of social ties. To mourn these losses is impossible on two levels: both on the level of the unfinished nature of the process of loss, and on the level of the lost object or objects. It thus evolves into a sort of social melancholia, in a national context still burdened by the unfinished mourning of a modernization without democratization. This social melancholia is nourished by a forceful return of figures of death,  with incessant announcements of suicides, and with new renunciations and departures, such as those of the educated youth who leave the country with their diplomas to join the circuit of ‘selective immigration’. And so the triumphal excitement of fascism presents itself as the inverted image of this melancholia. In this context of total social crisis we must ‘invent or perish’, as Lefebvre used to say. And to enable invention to assert its rights, we must first re-establish the constellation to which melancholia originally belonged and which is nothing other than a legitimate revolt in the face of loss. 1. ^ In the 2012 elections, the Golden Dawn party, which depicts itself as ‘nationalist’, received 6.92 per cent of the votes (425,990 votes in total), thereby winning 18 of the 300 seats in the Greek parliament – 17 men and 1 woman. 2. ^ These include racist, homophobic and political assaults. The assault carried out by the deputy leader of Golden Dawn on two deputies (belonging to the Greek Communist Party and Syriza), on live television, just before the legislative elections in June 2012, is emblematic of the public character of these assaults. 4. ^ According to the recent estimates of the General Confederation of Greek Workers, nearly 40 per cent of salaries do not include medical cover while one-third of the population (including children) no longer has medical cover. 5. ^ Henri Lefebvre, Critique de la vie quotidienne III, L’Arche Éditeur, Paris, 1981, p. 164. 6. ^ Ibid., pp. 42–3. 7. ^ In the same way, neoliberalism reduces liberal democracy to its shadow, as Wendy Brown emphasizes in her essay ‘A présent nous sommes tous démocrates’, in Démocratie, dans quel état?, La Fabrique, Paris, 2009. 9. ^ In imperialist war, ‘[i]nstead of draining rivers, society directs a human stream into a bed of trenches; instead of dropping seeds from airplanes, it drops incendiary bombs over cities; and through gas warfare the aura is abolished in a new way’ (Benjamin, ‘The Work of Art in the Age of Mechanical Reproduction’). 11. ^ The journalist Dimitris Psarras has written a particularly detailed and well-documented exposé of the origins and filiations of the neo-Nazi party. See his Le livre noir de l’Aube Dorée, Polis, Athens, 2012. 12. ^ Sigmund Freud, ‘Mourning and Melancholy’, in The Standard Edition of the Complete Psychological Works of Sigmund Freud, vol. 14, pp. 237–58.